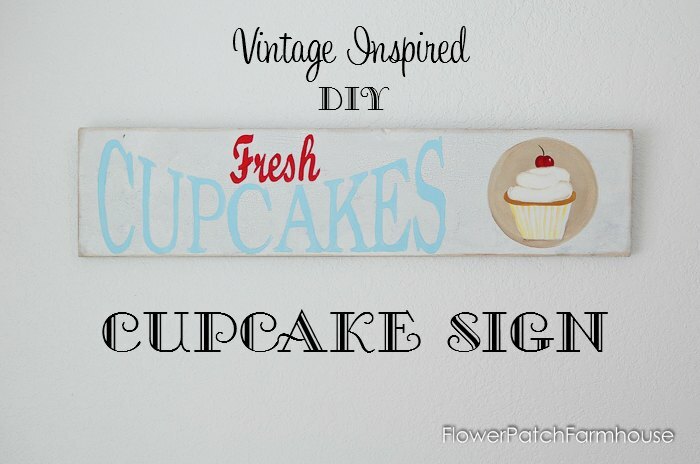 Easy Paint a Cupcakes sign, DIY fun anyone can do. 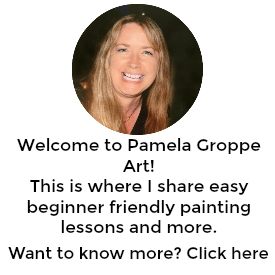 Step by step tutorial with links to extras that you will find helpful. Full list of supplies included. 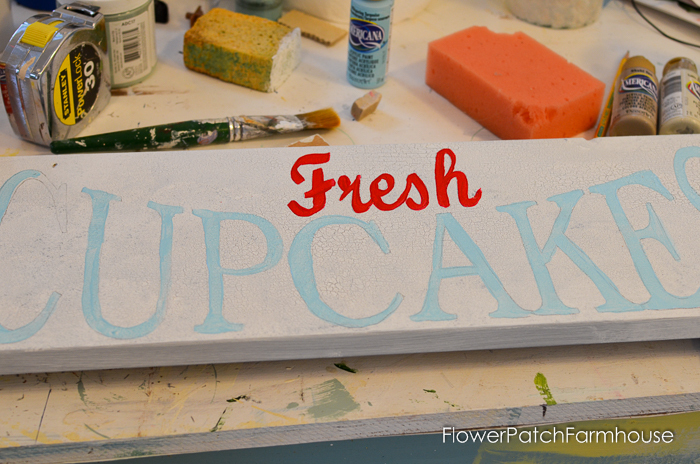 Paint a Vintage Fresh Cupcake sign!Are you ready for some painting fun? 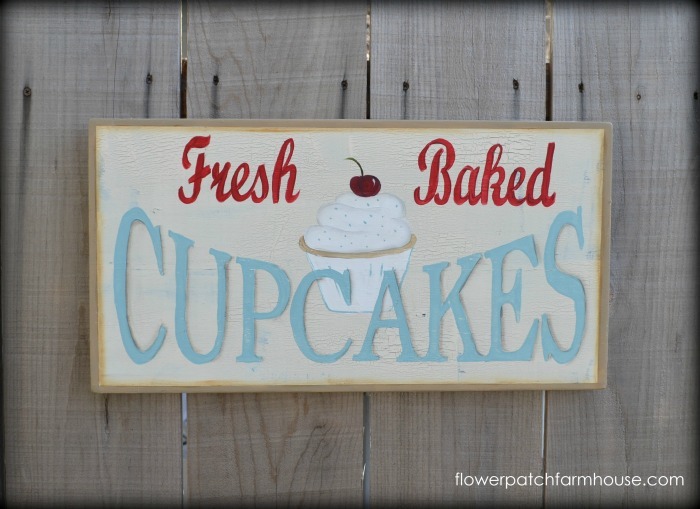 I love vintage inspired signs and I have made of few of these Fresh Cupcakes signs in different forms for my website shop. All are sold out but you can create your own. 2. Paint on a layer of Americana Decor Chalky finish paint in Yesteryear. 3. Paint on a layer of Americana Decor crackle medium. I do this with a random paint stroke pattern. 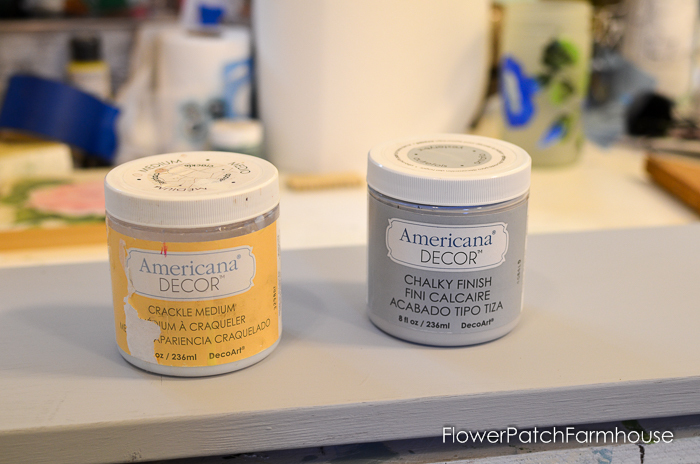 Click here for how I apply crackle medium. 4. Paint your top coat of Americana Decor Everlasting. You can apply this with a brush or sponge it on. I used a brush this time. 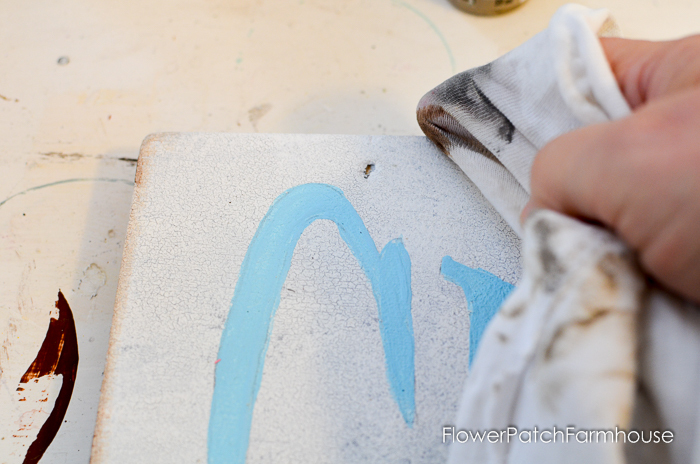 Be careful and not go back over it when wet, you will lift spots as the crackle medium starts to work right away. Brushing takes a bit of practice but is not hard so go ahead and give that a try if you like. The crackling appears as the paint dries. 5. 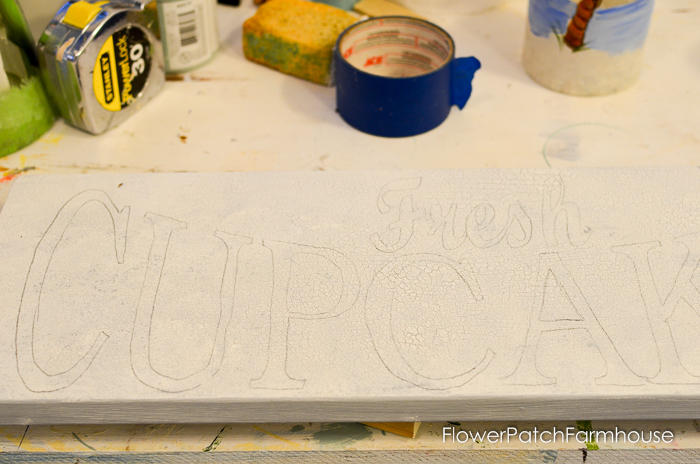 Transfer the lettering using graphite paper. For more on that go to my post at How I Paint Lettering. I used the Primary Red for Fresh and Whispering Turquoise for Cupcake. I painted two coats of each for opacity letting each coat dry before adding another. 6. 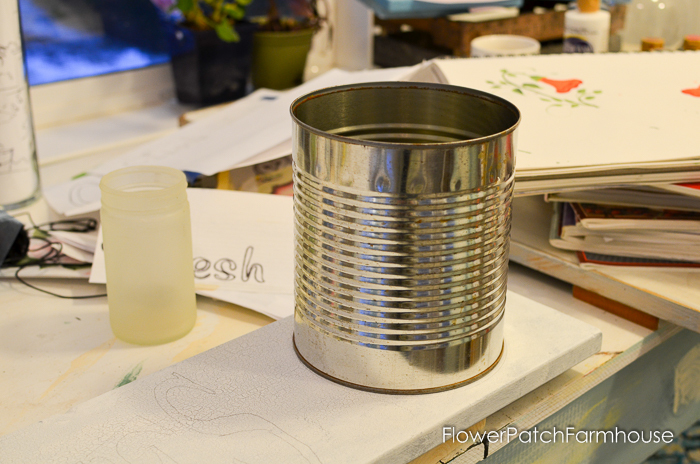 For the circle which the cupcake is in I used a gallon can but I have included the circle in my pattern so it is easy for you. 7. I fill in the circle with a mix of Sand and Khaki Tan. Do not blend it in,you want the variation in colors. I did put a bit of a darker edge down at the left bottom. 8. 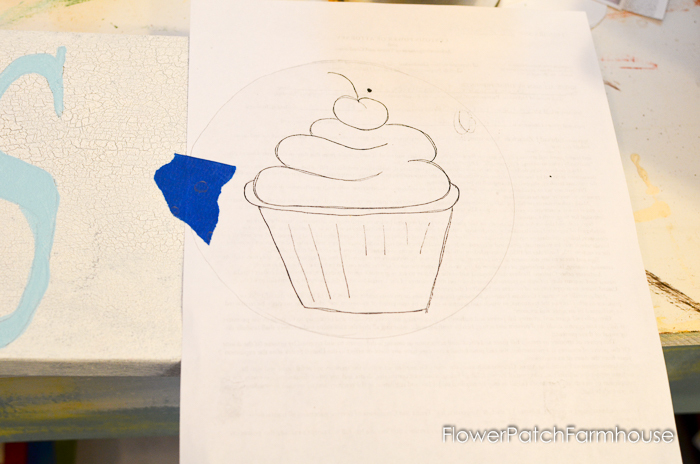 Center your cupcake pattern in the circle and transfer. 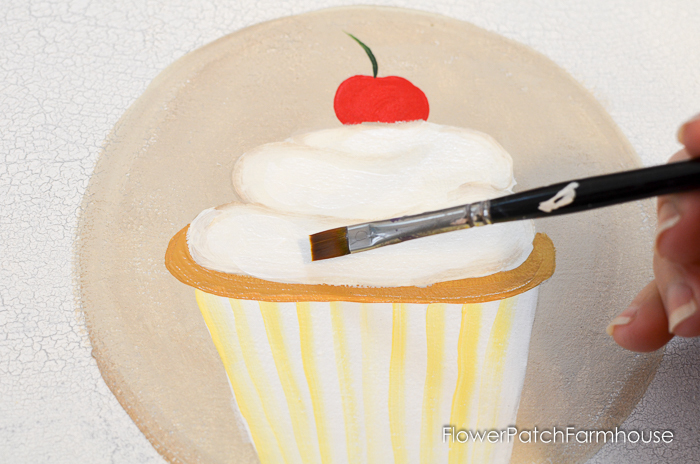 Being the colors of the cupcake are so light you will need to do a few coats to get them opaque. 9. 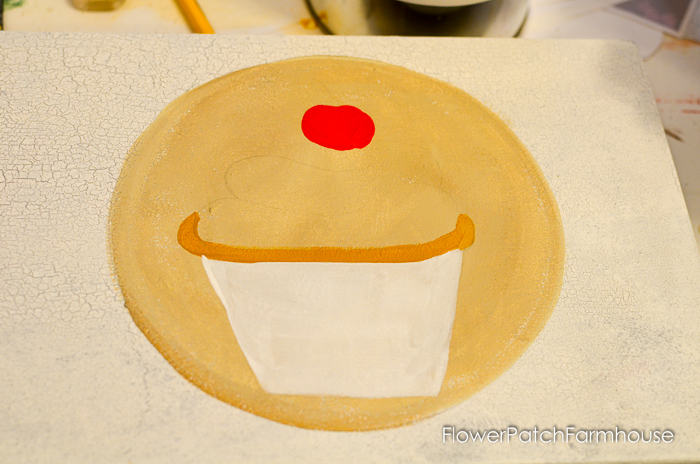 Start with tan and paint the cupcake edge showing between the frosting and cupcake wrapper. 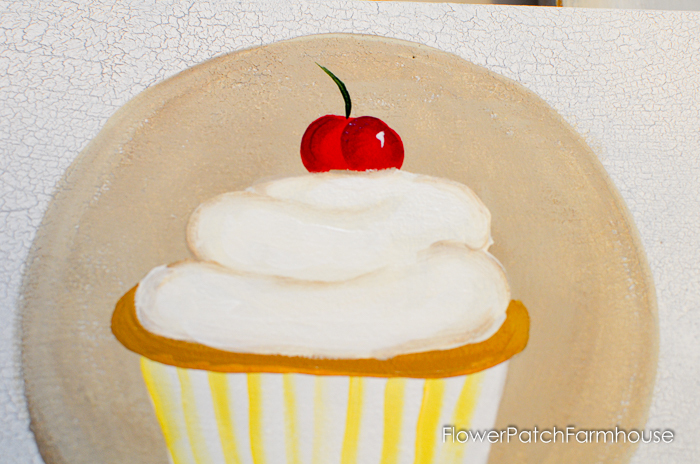 Then add the white for the wrapper and paint the cherry with Red. Use warm white for the frosting. a bit of shading of tan to show the swirls in the frosting. I do this by dipping my paint brush in the warm white then sideloading my brush with the tan and lightly follow where the swirls should be. 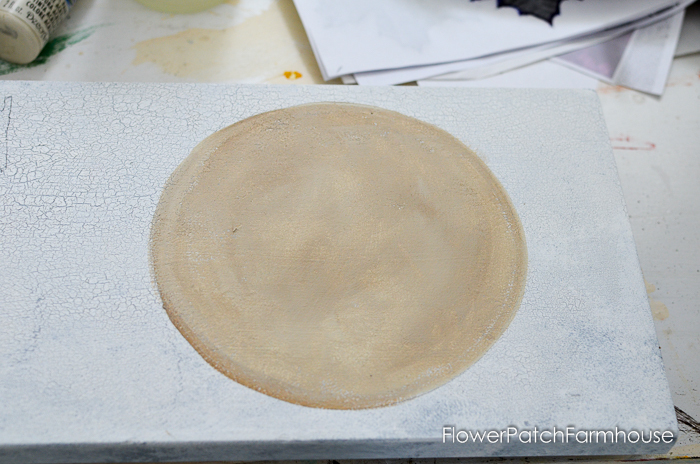 You will need to look at your pattern as your lines may be obscured by the base coat of warm white. 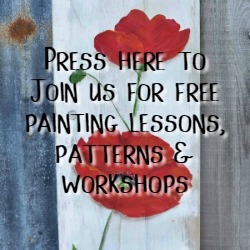 You can keep the pattern attached to your board and bring it down again and lightly trace the lines again but be very soft, you don’t want the pattern lines to show thru your paint. Load your brush with white and side load with yellow. Stroke the lines on the cupcake paper to make it look like ridges. I got the color too dark so I go back over it once it is dry with a touch of white on my brush. 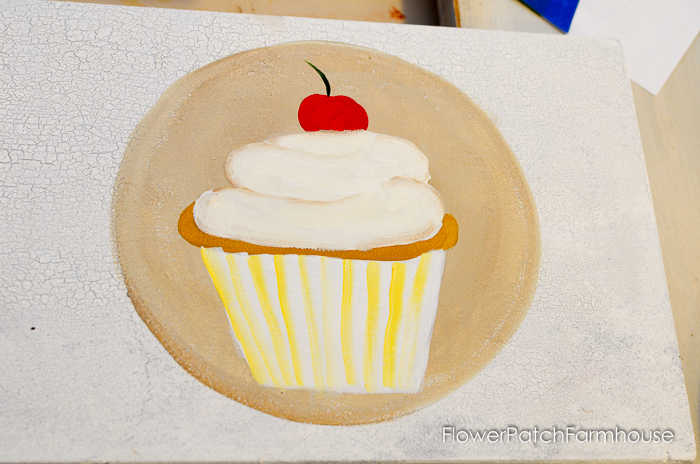 Also add a bit of highlight with white paint in the center of your swirls of icing. Add details to your cherry with a touch of Burnt Umber mixed with Primary Red, with the corner of your brush make the C shapes on the cherry to shade the left edge and the center crease. Add just a touch of white for a spark of highlight. Then with a liner and a some Evergreen add your stem, if you wish you can do the stem with Burnt Umber. I take a rag and touch it in some water so it is damp, tap it in a dark color like black or burnt umber and rub a bit out, then I rub the rag with my finger along the edge of the sign for a bit of aging. Now finish with a coat of varathane or you can hand wax it. For ease of use and no odor I love Americana Creme Wax, it goes on like butter and buffs to a wonder patina. It also comes in darker colors for aging effects. Now sit back and enjoy your work. Another way I painted this pattern..
Keep scrolling for supply list with links! These are the colors I used but you are welcome to use whatever you have and change it up.